Super Meat Boy Galaxy is a prototype for a 3D version of Super Meat Boy set on a Mario Galaxy-esque globe. It was created by developer at Preloaded, Aubrey Hesselgren, as a 30th birthday present for Super Meat Boy programmer, Tommy Refenes. On his blog, Hesselgren has announced that he's decided to hold his own prototype to ransom in an attempt to raise £10k for the The Samaritans. 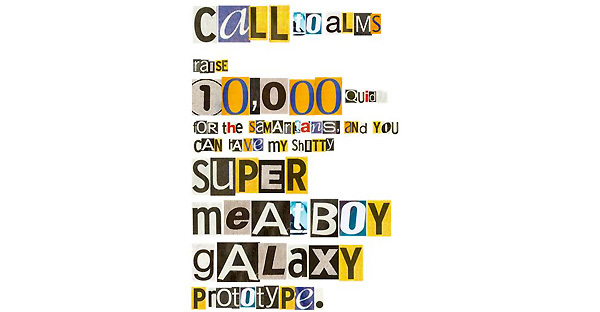 Here's the ransom note. "Bear in mind that this is a prototype, and as such will not be as friendly and polished as a final game," he adds. "Its main purpose was to investigate whether Super Meat Boy’s kinaesthetically pleasing platforming physics could survive the leap to 3D, given the right camera and level layouts." This video suggests that those pleasing platforming mechanics translate rather well, don't you think? Developer Aubrey Hesselgren has released a video of his "completely unofficial 3D version" of Super Meat Boy, which he whipped up for Tommy Refenes' (one half of Team Meat) 30th birthday. Using Unity and Blender, Hesselgren - also known as HilariousCow - combined SMB's bloody walljumping with the wraparound worlds of Super Mario Galaxy, and the result is a demo/proof-of-concept that's far better than many commercial attempts to move a 2D series into the third dimension. Of course, with this being a birthday present - and "a bit of a training exercise" - Hesselgren has said that he probably won't release it to the wider world. At least we'll always have this video, which shows that it is possible to convert something like Super Meat Boy into 3D, if you take the time to get over the camera hurdles. Can someone do Binding of Isaac next, please? Hotline Miami is all about learning through repetition, then executing a perfect murder ballet. Tyler Wilde, Associate EditorThe word "repetitive" commonly has a negative connotation, and it's especially used negatively (all the time, every time, forever and ever) when talking about games. And often it's followed by a bunch of no elaboration at all. That doesn't make sense. I'm sure I've done it before, but criticizing a game for being "too repetitive" and leaving it at that is—strictly speaking—meaningless. A game might lack variety, but every game is repetitive. We repeat some pattern of input—running and shooting, stacking blocks, bouncing balls off blue dots—over and over, and expect uniform feedback. Then the problem changes slightly, and we tweak our input pattern. And then again. And yet "too repetitive" is lobbed at games all the time. Alright, I know that sounds a bit pedantic, and I do recognize the difference in tone between "repetition" and "repetitive." Lack of variety is a fair criticism, but "too repetitive" is an extremely vague way to say it, and it dodges the truth: when we criticize a game for being "too repetitive," I think we often mean that we just don't like what we're doing. "It's repetitive" is shorthand for "this isn't fun (for some reason)." If we like what we're doing, repetition is desirable. I like solving puzzles in Portal, and once I solve one I want to solve more. I don't want to solve the exact same puzzle again, but I don't want to stumble into a surprise Sudoku chamber, either. So Portal gives me increasingly clever arrangements of portal-ey logic problems. The puzzles get harder, but they're all just iterations of the same basic spatial problem I solved in the first puzzle. So after all my twisty, knotty figuring arrives at a solution, it always seems just as simple as the first time. That sense of clarity comes from repetition. Super Meat Boy replays your failures, illustrating your own learning process. Repetition is also how we learn, and both Super Meat Boy and Hotline Miami succeed by embracing that power. They present problems in small chunks—a level in Super Meat Boy and a floor of thugs in Hotline Miami—and rapidly reset them every time we fail. Each attempt gives us new information to apply to the next, building layers of experience on the way to that one perfect run. And that perfect run feels good: it's an accomplishment, like unknotting an especially tricky puzzle in Portal. Except in Hotline Miami there's more brain-stuff and skull chunks lying around afterward. The same goes for Counter-Strike, StarCraft, and the rest. At their most basic levels, they're about repeating and mutating input patterns to solve variable, but not totally unpredictable, problems. The variables in Counter-Strike, for example, are the guns, maps, and opponents. That's been enough variety to keep us repetitively shooting at each other for 13 years. Repetition can be pretty damn fun, so we've got to be specific, and always ask ourselves if it's really the repetition of a theme that bothers us, or the theme itself. I can shoot bad guys all day, so complaining that "the shooting is repetitive" in Medal of Honor: Warfighter would be confusing. Further examination would reveal that the guns, maps, and enemies have specific traits I don't like, which has nothing to do with repetition (except that the more I do them, the less I like them). Fearing the dreaded "repetitiveness" may even be bad for games: that's probably how we end up with off-key phrases at pivotal moments, like a boss fight which takes away the gun I've been using the whole time and sticks me in a surprise platformer. It's variety, but it screws up the whole composition. A performance of Rachmaninov's Piano Concerto No. 2, for example, would not benefit from an unexpected dubstep interlude. No, I wasn't talking to you, Skrillex. Are you drunk? Go home, dude. Anyway, if at first glance this looks like an ostentatious rant about a personal pet-peeve, then you may have seen correctly. But maybe not: try Googling any game name with the phrase "too repetitive." It's everywhere. I get what's meant by it (sort of, kind of, some of the time), but it says very little. It may not even be a criticism, because games like Hotline Miami wouldn't be fun without repetition. If dying and respawning didn't reset the level, and our prior kills stayed bloodied, it would be ruined. Maybe then we'd say that it's not repetitive enough? The Basement Collection, a collection of 9 award winning indie games from the creator of Super Meat Boy and The Binding of Isaac, is now available on Steam! Additionally, if you previously owned Super Meat Boy, The Binding of Isaac, or Gish on Steam, you'll receive 30% off for a limited time! Edmund McMillen, the man behind Super Meat Boy and The Binding of Isaac has announced the release date for The Basement Collection. A grab bag of his earlier projects, many of the titles have been polished up with new visuals, music, and even content in some cases. It'll release on August 31st for $4 on Steam. McMillen also boasts that "Every game will come with bonus content, ranging from development sketches to early playable prototypes and tech demos," and "will also feature four very large bonus unlockables that should make fans of my work quite happy." The Basement Collection will also come with a free soundtrack, including 10 fan-made remixes.